Ever wished your phone could show you what sugar looks like really big? A microscope small enough to be used on a mobile phone could help third world workers detect diseases or monitor water supplies. 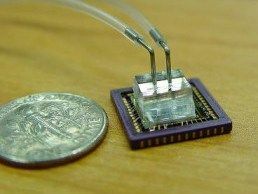 The super-compact, high resolution microscope is around the size of a 20 pence piece, but the imaging equipment on the chip would be the size of the queen's nose. "Our research is motivated by the fact that microscopes have been around since the 16th century, and yet their basic design has undergone very little change and has proven prohibitively expensive to miniaturize. "Our new design operates on a different principle and allows us to do away with lenses and bulky optical elements," says Changhuei Yang, assistant professor of electrical engineering and bioengineering at Caltech, the company that developed the device. Talks are now underway with carious biotechnology firms to mass-produce the device, which would also be implanted into the body. "An implantable microscope analysis system can autonomously screen for and isolate rogue cancer cells in blood circulation, thus, providing important diagnostic information and helping arrest the spread of cancer," says Yang. A more detailed explanation of the micro-fluidics at work in this device can be found over at Physorg.com, if the 'it's small and magical' explanation doesn't do it for you here.